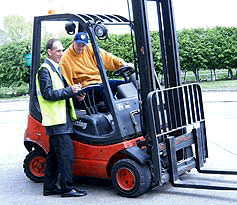 Here at Dewar's Forktrucks Ltd, we can offer you a complete service, including Forktruck Driver Training. Our Trainer who is a member of R.T.I.T.B accredited and specialises in on site training at the customers premises. We can offer you the choice to train 1 person or in groups up to 3 persons. After the training (and subject to passing) your Forktruck Driver will be given a certificate which you will need for your Health and Safety.